In a hurry to play racing games the way they are meant to be? We can't blame you! That's why we have Ready to Race bundles, so you can buy a Playseat® chair together with the Thrustmaster TMX Pro, with a discount of 10%! Don't wait any longer and order the bundle, so you can start racing like a pro. This bundle includes a Thrustmaster TMX Pro and a Playseat® gaming chair of your choice from our assortment. 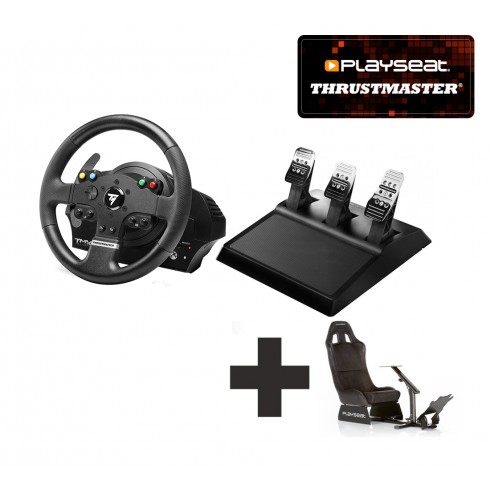 Pro Sim racers can now enjoy the quality of the Thrustmaster TMX wheel plus the highly-awarded three-pedal Thrustmaster T3PA pedal set as an added bonus in the Thrustmaster TMX Pro bundle! It’s a deal that racing dreams are made of! PlayStation racing fans behold: the Playseat® Evolution PlayStation edition is here! This official licensed PlayStation racing simulator combines the unique Playseat® quality with a stylish PlayStation design, made for the true PS fans! The new Playseat® Evolution FIA: a racing chair for all motorsports fans! This is the officially licensed FIA edition of the popular Playseat® Evolution racing simulator! It features the official FIA logo, stitched on the comfortable, high quality blue Alcantara upholstery and on the patented blue frame. Experience the thrill of racing in Formula 1 with the official licensed Playseat® F1 FIA! This is the new F1 model from Playseat® for all motorsports fans who want to experience how realistic and fun racing games can be! Take your racing to the next level with the Playseat® Sensation Pro - FIA racing simulator! This is the FIA edition of the Playseat® Sensation Pro series, for all motorsports fans who want an unparalleled racing experience!